The Ailesbury Road outfit got the better of a game Gonzaga College, who were playing in their first ever rugby final, with a 28-5 win. 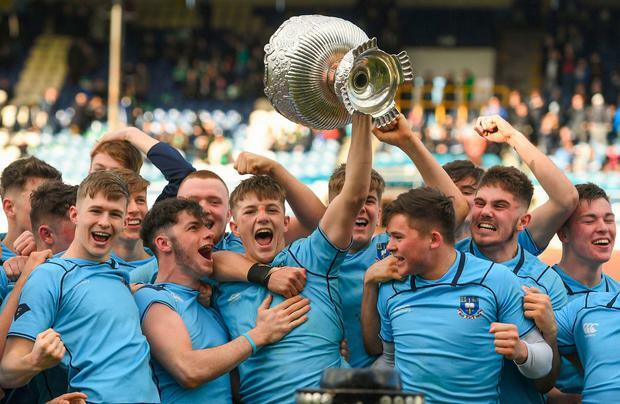 A huge crowd turned out to the RDS as the two Dublin schools locked horns. St Michael's took an early lead with two tries from Jack Boyle and they never looked like relinquishing their advantage on a bright spring day in Dublin 4. Gonzaga battled hard in their first appearance in the Leinster schools' rugby showpiece though, and Jack Coolican notched a first-half try to keep them in touch. Second-half tries from Lee Barron and Rob Gilsenan were enough for St Michael's to claim the trophy for just the third time. The school's junior side will hope to make it a double when they take on Blackrock College on Wednesday. Meanwhile, the Munster decider saw Cork rivals Presentation Brothers College and Christian Brothers College face off at Irish Independent Park. In a tightly fought encounter, CBC won out 5-3. Head coach Tommy Crowe said after the win: "We're just delighted to get across the line. Absolutely delighted."